●The buses that arrive and depart within Mine city accept cash, ticket purchased in advance, or prepaid bus cards (bus pass will be referred to later). 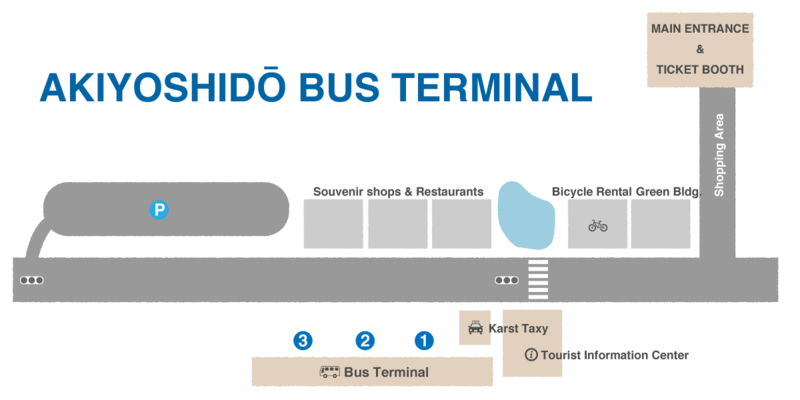 ●Get on the bus from the door in the middle and pick up a numbered paper ticket from the dispenser on the right side of the step. And then find the same number and the price on the electric fare table in front. Prepare the exact amount and put it into the box next to the driver when you get off. Use the exchange machine built in the box if you do not have the exact amount. ●Bus ticket and prepaid bus cards are available at some vending machines and the bus terminals including our tourist information center. We sell ¥1,000 and ¥3,000 prepaid bus cards, and there is an equivalent to ordinal ¥1,100 and ¥3,360 bus fare respectively. It means you get a ¥100 or ¥360 discount. Please add the deficient amount with cash. There are 2 kinds of bus passes acceptable here in Mine. Taxi is very convenient since the tourist sites are scattered all over the city and the number of buses is limited. Few taxis stay at the tourist information center and Kurotani entrance of Akiyoshidō. Please ask the counter if there is no taxi around. Every tourist site has a parking lot. 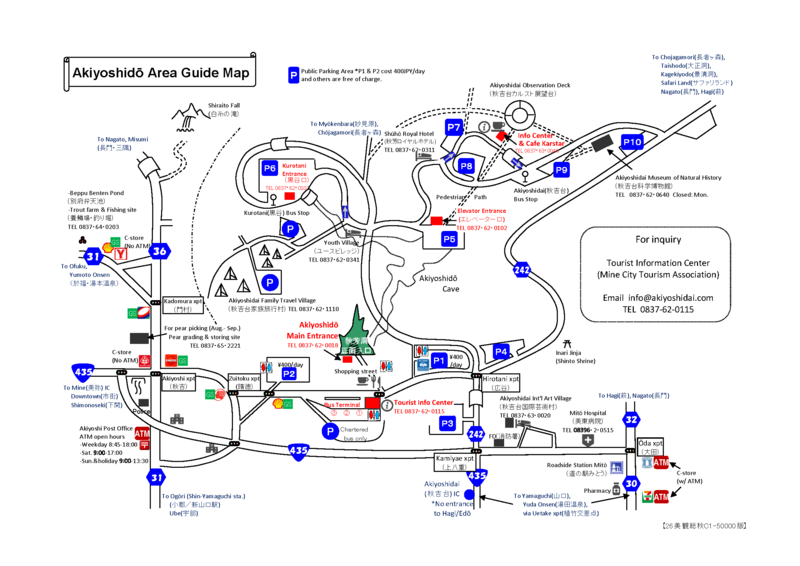 As for the public ones, 1st and 2nd parking lots near Akiyoshidō cave cost ￥400/day and others are free of charge. As for car rental service, we recommend you to find the one around Shin-Yamaguchi station or Yamaguchi Ube Airport. We are sorry that there are no ATMs in the tourist area. Please prepare cash in advance.There are three ATMs nearby in a 5 to 10 min driving distance.